This is from the Huff Post about Alberta's historic election. This is just the beginning of a momentum that is building in this age of transparency and expansion. I love this woman and feel she is making a tremendous difference for how down to earth she is and reasonable if not in her positive attitude having become so contagious. She's real. We'll see how it goes she has a tough job ahead of her and ya just can't please everyone and best not to piss off the majority either, like Prentis did. EDMONTON - The NDP has won its first majority government in Alberta by toppling the Progressive Conservative colossus that has dominated the province for decades and driving leader Jim Prentice from public life. The New Democrats, under leader Rachel Notley, swept all 19 constituencies in Edmonton on Tuesday and made significant inroads in previously barren NDP territory in Calgary, Lethbridge and rural Alberta. The Wildrose party took second place and will form the official Opposition, while Prentice and his battered PCs had to settle for third. It was a crushing defeat for the Tories, who had steered the ship of state since 1971 – longer than any party anywhere in the country. Prentice told subdued supporters in Calgary that he was stepping down as leader effective immediately and would also leave the Calgary Foothills seat he just recaptured. "As leader of the party, I accept responsibility for tonight's outcome. I also accept responsibility for the decisions that led up to this evening,'' he said. Prentice called the election on a budget to reform the way Alberta taxes, spends and saves. "Albertans needed to make those choices, those decisions, and they have now done so and chosen our collective future,'' he said. "And while I'm personally saddened by the decision, the voters are always right in our democracy. Wildrose Leader Brian Jean, Liberal Leader David Swann and the Alberta Party's Greg Clark were also elected. The NDP win is a tectonic shift in Alberta politics, which has seen government change hands only four times since the Liberals won the first election when Alberta became a province in 1905. 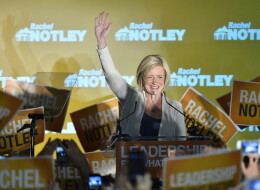 Notley had momentum since the leaders debate that most pundits said she won and the victory is a vindication of the pioneering efforts of her father, Grant Notley. He helped found Alberta's NDP and kept the movement alive as the sole NDP member of the legislature in the 1970s. He died in a plane crash in northern Alberta in 1984, two years before his party made its first big breakthrough in 1986 and became official Opposition. The NDP had never come close to power in Alberta. Its previous high-water mark was 16 seats and almost 30 per cent of the popular vote in 1986. It's the second defeat for Prentice at the hands of the NDP. He lost to the party in Calgary Mountain View when he ran for the PCs under premier Don Getty in 1986 before going on to a federal career. He would serve as a cabinet minister in several portfolios under Conservative Prime Minister Stephen Harper. Prentice, the fifth Tory premier since the popular Ralph Klein retired in 2006, is the latest version of Harry Strom, who was premier when the Tories under Peter Lougheed ousted the Social Credit in 1971. The party had held power for 36 years. The Tories were gunning for a 13th consecutive majority when Prentice dropped the writ on April 7. The election came a year earlier than necessary under Alberta law, but Prentice said it was necessary to gain a mandate to implement his tough budget that proposed sweeping increases in taxes and user fees and cuts in government spending. He said his goal was to stop Alberta's heavy reliance on fluctuating oil prices for its revenue. The campaign was supposed to be a victory lap for Prentice, whose party held 70 of 87 seats at dissolution. The Wildrose and the Liberals were both coming off leadership changes and Notley had only held her job since October. The campaign didn't work out that way. The Opposition Wildrose criticized Prentice for not going far enough with spending cuts and said it would not raise any taxes. Notley criticized Prentice for going too far with cuts, while sparing corporations from tax increases. Notley said she could balance the books by 2018 through increased taxes on corporations and the wealthy, while still spending more on health and education. While Prentice urged Albertans to be resilient to weather the storm of low oil prices and job layoffs, Notley was relentlessly upbeat and optimistic during her campaign. She urged Albertans to embrace uncertainty, accept it as a challenge and focus on making life better for families. It provided a stark choice for voters. This talks about our former Premier and one of many reasons he is an exPremier and pretty well represents the Progressive Conservatives including the Prime Minister since he's their leader and knows all about this and is perhaps, the most secretive of them all. 'The Tories chose to pretend the big blunder did not happen,' says consultant Jim Roy. Alberta's 'fair share' has plummeted due to bad forecasting and flawed calculations, says Jim Roy. Photo of Sandstone Valley, Alberta, Creative Commons licensed. That's not what Alberta's long-reigning government promised to voters in 2007. After a controversial royalty review, the first one in a decade, premier Ed Stelmach told Albertans that the new formulas for calculating royalties would increase Alberta's ''fair share'' of hydrocarbon profits by $2 billion a year, beginning in 2009. At the time Jim Prentice, then federal industry minister, supported the changes proposed by Stelmach. But instead of increasing royalties by $2 billion a year, Alberta's ''fair share'' plummeted due to bad forecasting and major flaws in how the province collects natural gas and bitumen royalties, Roy said. The management of Alberta's hydrocarbon income has become a significant election issue as the Tory government has posted a $5-billion deficit and raised taxes and cut services for ordinary Albertans. Since 2009, natural gas revenue for the government has experienced the greatest losses. The new formula implemented in 2009 made the royalty rate much more sensitive to price, and the new formula substantially dropped royalties for unconventional resources such as shale gas. Gas price and Alberta gas royalties. Source: Jim Roy, Parkland Institute. Despite a substantial increase in world oil prices between 2009 and 2014, bitumen earnings did not increase significantly. Any upward shift in earnings was largely due to added production in volume or project pay-outs. Bitumen developers don't pay royalties until they have written off their capital costs. But therein lies another problem, Roy said. Alberta has a low royalty rate for bitumen compared to rates in countries that have similar heavy oil resources. Alberta, for example, takes from 25 to 40 per cent of profit, equivalent to 10 per cent of gross revenue. In contrast, Venezuela, which also extracts heavy oil, takes 40 per cent of gross revenue -- four times as much as Alberta. The royalty expert also argues that the province has failed to control the pace of bitumen development. As a result, industry has put too much bitumen on the market and that glut, in turn, has played a role in driving down global prices. Bitumen prices and Alberta bitumen royalties. Source: Jim Roy, Parkland Institute. ''The oil sold at low price is gone. The money is lost. The world has given Alberta a clear price signal. Alberta would be foolish to continue increasing bitumen production for sale at low price,'' Roy said. According to Roy's calculations, approximately 40 per cent of Alberta's projected deficit for fiscal year 2015/16 could be eliminated by returning to the royalty formulas in place prior to 2009. Rachel Notley, the leader of Alberta's New Democrats, has already promised to hold a review of the province's royalty structure if her party wins next Tuesday's election. Premier Prentice contends that a major review of Alberta's royalty formula would have negative consequences. ''I don't think you ever say categorically in the history of the province we should never review where we stand on royalties,'' the former corporate banker told the Calgary Herald on April 29. But given low oil prices, ''it is the worst thing we could do right now where we are fighting to hang on to every job we can,'' he said. The province's oil industry has already come out against adjusting Alberta's royalties, among the lowest in North America. ''I don't think there's any room for any increase in royalties,'' Cenovus president and CEO Brian Ferguson told Bloomberg News this week. In 2006, Alberta's auditor general reported that the government planned to collect 66 per cent of the economic rent or profits available from petroleum extraction, but the government was not meeting its objective and was not clear about how it even measured economic rent. i find this facinating! She even talks about demons and shadow and living with them because we think they serve us. Caroline Myss is an Intuitive Healer. She can detect illness by the energetic impressions she receives from whoever she is assessing. She is correct 93% of the time and has helped many. She's forthright and direct, in a word truthful. I thoroughly enjoyed watching this. She makes the spirit, emotion,mind, body connection and how it works as a whole by being able to access the energetic field surrounding the body. She's not shy about how much we are consciousness unlike the denial of scientists who think the brain produces it. This woman does not mince words. I appreciate her honesty. Where did this notion that we have the power to shape our own destiny come from? How can we separate wishful daydreams from the authentic work of creation? With her intuitive grasp of spiritual truths and her no-nonsense presentation, Caroline Myss cuts through the myths surrounding manifestation on her wholly original new audio programme, Your Power to Create. Taking a direct path to the heart of human creative power-and how each of us can learn to harness it-Caroline Myss opens the doors of understanding to: - What stops us from creating? How to overcome the fear that holds you back - From Revolution to Revelation, and all the stages between-the cycle of creation that governs cultures, epochs, and our individual lives - How the will of the divine makes itself known to us in every moment-if we know how to listen - Applying your creative power to your health, your financial well-being, and your relationships - Five steps to true manifestation: practical tools for unlocking your creative power, and much more. Caroline Myss teaches ability to shape reality is a divine gift-but it is a gift that must be trained, strengthened, and practised as a living discipline every day. Now, this gifted teacher brings her trademark passion, candour, and extraordinary insight to help you unlock Your Power to Create. Check out his website its very interesting, he covers so much of what James has written about in Dorhman Prophecy, Quantusum etc. It's all very real for those who feel it and with a minimum of implants interefering. can't deny it any more ... Nibiru is on its way and will be effecting us by Fall - seems that the PTB have co-ordinated their plans (JADE at the Helm) to match this fly-by - and that a pole shift is emanate - Sure hope you are as prepared as they are ... I've spent the past month, getting the last of my preps ... and feel confident that my family will be safe no matter what comes ... there is no fear, when you are prepared and it acts as a great motivator - if you are not. https://www.youtube.com/watch?v=6AIpBZos4Rk now that you can see it with your own eyes, how can you ignore it? “Birds Are in a Tailspin Four Years After Fukushima: Bird species are in sharp decline, and it is getting worse over time… Where it’s much, much hotter, it’s dead silent. You’ll see one or two birds if you’re lucky.” Developmental abnormalities of birds include cataracts, tumors, and asymmetries. Birds are spotted with strange white patches on their feathers. Phenomena IS Deception. Think of where your perception comes from and feel where it can be. Heart Intelligence is mighty powerful in changing perceptions and jumping time lines. This is for those open to this who just feel it in their hearts...and can see from a much larger overview. No offense to you starduster, you have made many aware of things some find very difficult to look at. And in that awareness much has been mitigated. Kudos to you!! The choice is do you want to live in fear and allow that to determine an outcome or just simply say, "I don't know but am open to all possibilities." And perhaps, some of those possibilities have been in operation for some time now just waiting to be acknowledged and shared because of not being determined by or through fear. I don't reject any emotion, but with these materials, reveling the purpose that they were intended to serve, I have learned to master/redefine them, and how to use them as they were intended. Fear was originally intended to motivate us to prepare for ALL that IS (without judgment), and when we are prepared, there is nothing to fear ... being prepared, boils down to our relationship with Nature, which was designed to provide for our every need ... our understanding of Earth/Nature's purpose, keeps fear from becoming overwhelming. Fear (emotions) were created to serve us, not to control us ... and if fear does anything more than motivate you to be prepared/have a symbiotic understanding of Nature, then it is out-of-control, and there is no one to blame but yourself for this state of being. No matter where I am or what tecnology or not, my focus comes from Heart Intelligence and with that all I have to do is... through purposeful focus on the Heart ... BREATHE. It always works no matter what because I have honed my focusing abilities for such and with purpose, any one or all of those Six Heart Virtues are exercised freely and often. It really is that simple and what eludes the more intellectually inclined. It comes from within and when prepared there, the without doesn't matter because you can deal with it from where it was created if not beyond that. This is another reason to check belief systems and have as few as possible if none at all. I am coming from some extremely stressful times where there has been no let up for almost 6 monthes now and in the city! Just recently it has been topped off with the sudden and unexpected transition of my mother. This has launched me into a greater overview. We were quite close and I cannot describe in words my love for her. I send it to her where ever she is now. I am happy she doesn't have a broken down physical body to contend with anymore and can appreciate that she really did do the best she knew how. I am forever grateful for her kindness and generosity and incredible strength through so many trying times in her life and how easily she could put aside all differences to help someone, even as religious and somewhat judgemental as she could be at times. She let it all go because her heart spoke to her louder than her head and she abided by her heart. She is one of the most remarkable women I have ever known. Through adversity in particular she challenged me to the max because we seemed to of come from opposite sides of the spectrum. However, it is what helped me to hone my strength and love her no matter what because that kind of love overrides anything and everything. She helped me to to see and understand so much specifically because I had to see it from another perspective. There is a reason why this is called The Hologram of Deception. Something like The Truman Show. I like how he found the exit in the end through challenging his fear... Sometimes we are forced to do that in ways unexpected and that no external preparation, only, will help. Preparation is with and within our Hearts FIRST, it is what Quantusum is about. Some things cannot be unseen. What I have recently seen will change my life forever. I can never look at the World the same way. For my own safety, I can give you no clue as to who I am or what I do, all I can do is write this down, and have somebody who is not related disseminate this on my behalf, and hope they can remain anonymous as well. I can tell you I work at a US Government Laboratory, and at some point in the last year, I was privy to a program that changed me forever. To put it bluntly, they can see your soul. Not just yours, but everybody and everything's souls. This technology has become pretty reliable and will probably be implemented on the next generation of UAVs. I will try to put this all in layman's terms so it can be understood by all. There is an sub-atomic energy force that is animating all living creatures on this planet. This energy resonates at a varying frequency, but in a very narrow band depending on the being. For example, Human beings energy resonates within a particular frequency range, this frequency is constantly changing for every single being. The technology was developed to detect this energy field, which is much larger than the actual body, and completely surrounds it. Because it changes so fast, the software needed to scan the know frequency and be able to follow and track the frequency as it changes. The listening device is modeled after an insects compound eye, with each sensor detecting an individual frequency, the software then takes all the signals and composes it to an image that is visible on a computers screen. The result looks a bit like infrared, but the colors change as the frequency changes. With this, they can tell how comfortable somebody is by their resonant frequency, such as at a security checkpoint. They will also be able to track your 'soul' from a low orbit satellite. There is no way to hide from it as you could from an IR camera. Different species resonate at different frequencies, for example, a Dog resonates at a much lower frequency than a Human. Surprisingly, I have been told some lower life forms resonate at much higher frequencies than Humans. But everything we can see on our planet, is resonating within a fairly narrow frequency range. The part that scared me the most, is that we are not alone. There are a multitude of life forms not visible or inter-actable with us. There are a LOT, it would seem that this planet is quite crowded by a lot of different life forms that we cannot see. By adjusting the receiving frequency we can see what appears to be completely different biomes resonating at higher and lower frequency ranges than what our spectrum shows. And we can now look at them, to a degree. We can see highly populated groups of beings all living in different energy frequencies than ours. We are absolutely not alone. here is a new (to me) perspective of the now, that our media has ignored - and we have been experiencing since July 7th (will reach a creshendo in Sept and we will have exited by mid October ... that may be and evolutionary leap for mankind, as their dormant DNA is activated by the frequencies of this "cosmic energy"
RUSSIAN SCIENTIST SAYS THE SOLAR SYSTEM IS MOVING INTO A NEW ENERGY "ZONE" THAT IS TRANSFORMING THE MAGNETIC FIELDS OF THE PLANETS. The scientific report below is so strange that I was not prepared to believe it or send it out to you until I contacted my old friend, peace poet, writer and translator, Igor Mikhailusenko in Moscow to find out if the scientist named below is a respected individual or just some kind of a kook. I can't really investigate the science but the least I can do is ascertain the reliability of the scientist. Igor reports that the man is well-known and respected among Russian scientists and therefore I pass on the very interesting report below. We have always looked on the sun as very permanent and unchanging. But in fact we have recently been reading American scientists' reports of much larger magnetic storms on the sun than ever before. Sunspots have become larger or more numerous or the like, but no explanation has been offered. Now we may have it. I've not followed solar activity much but left it to others, not understanding that it could affect our real world situations. Now it seems that what may really be happening is larger than just sun spot changes. It may actually be as Dr. Dmitriev seems to suggest that the entire solar system is moving into a new area of the heavens where things are indeed different. We've always known that just as our planet revolves around the sun and in doing that passes through different areas so there are more meteorites at certain seasons than at others, so also the sun itself with the entire solar system around it has an orbit of its own. Orbit ? That would suggest a center around which it revolves. I'm not sure of that, but it is clear that the entire solar system is not fixed in space. It must at least move with what some refer to as an "expanding universe". So as it moves there is no reason to think that it cannot move into areas of different kinds of energy. Are these energies physical only ? What is the difference between physical energy and spiritual energy ? I have long believed that just as physical energy can be transformed into matter (e=mc square, a la Einstein), so also it seems likely that there is some similar relationship between spiritual energy (love) and physical energy. Well that is only my own intuitive feeling, but now we have some evidence that there really can be some vast changes affecting all the earth and all the planets at the same time. Whether the effect is physical only or also spritual remains to be seen and experienced. Now Igor also deserves some credit here. Without his input, his assurance that this scientist is credible, I would not have forwarded the report that follows. From the age of 10 when he lost both legs during a Nazi air raid, Igor has been a poet for peace writing and traveling and publishing books dedicated to a meaningful spiritual change for the earth. I"ve known him since 1984 and met him personally in 1986, brought him to the U.S. in 1987. There is no question of his sincerity and dedication to peace. However, since the end of Communism when disabled people were fairly well cared for, things have not gone well for Igor. But in recent times he has been given an old computer and is now able to do email with many people across the world. Though he cannot himself access the web with his old equipment, a friend has created a website for him. You can visit it with a click on http://www.aztecfx.co.uk/aa/igor/select.html . There you will learn about the books he is publishing in English. and here is a more detailed account by a man who stakes his reputation, on his ability to put dots together ... which to me sounds very much like the "Shift" that the LTO has urged us to prepare for. GET EXTRA SLEEP. DRINK EXTRA WATER. MEDITATE! Is it not true that James has said the Earth has transformed and we are catching up to IT. Problems and fears are being taken care of We do not have to do anything. Gaia is becoming a Star and We are becoming the Planet. Earth is a Universal Entity, our higher self, needs to be "a step ahead" (and it always has been) but in case you hadn't noticed, Nature has been weaponized recently ... and the powers that be, are trying to get it to shoot itself in the head ... we (it's inhabitants) already experienced the results of being "engineered" before, now the focus is on (geo)engineering Nature ... "god" is done , he has lost control, and will loose what little control he has of his slaves (to loot this planet of its resources), when our DNA passes through the cosmic energies designed to enhance this Species' consciousness, to a new level of (self) awakening - to what we are participating in. lyricus reveals that the Universal Entity is responsive to our demands - but if we are ignoring Nature... and the only one making demands are TPTB, it has no choice but to respond to their demands, because they are also members of this species and thousands of them are focused on enslaving Nature.... and billions of us are supporting their efforts - because we have become dependent upon them, to provide for us... 80% of the world's population are god-worshipers and have surrendered their Free Will to him - they chant- "thy will be done" because the even though they can see what "his will" has done, is not in their best interest, they still trust that he will "save them"
yes, we are all in this together ... but we have the ability to create our own reality , within the collective ... where god can not exist ... that is what the Wingmakers did ... and that is what I am doing with my energy ... experiencing INDEPENDENCE , as our creator intended when he created Earth. the following vid, is making you aware of the opportunity you have to reach your full potential in (this) Life, while still in the body. Those of us with an open mind, can contribute to the realization of a Sovereign Integral state of consciousness once we project that image upon the Universal Entity's mirror ... and it is big enough to reflect us all, living in the frequency of Love, unconditionally. I found it very comforting to know, by listening to this vid ... that we haven't got long to wait before we can realize our full potential and that there are others prepared to assist ... I am, sovereign; We are integral to the Plan of First Source becoming manifested - now. Wave X is the term given by Dr. Simon Atkins to the big wave of electromagnetic frequency that is has been prophesized to arrive on the planet at the end of September this year. There is scientific evidence that proves that electromagnetic frequencies from the sun affect every living thing and its consciousness on the planet. How will Wave X’s electromagnetic and cosmic frequencies affect you? You are actually the best person to answer this question. Earth and its inhabitants have been receiving bursts of Source light energy in the form of solar flares and gamma rays for thousands of years now. As Earth, the solar system, and the galaxy aligned with the center of the Universe at the end of 2012, all were able to begin to receive rapidly increasing transformational energy waves from the center of the Cosmos, or Source, that are raising the vibrational frequency of everything in its path. 2012 to 2013 seemed like a period of rest and preparation for many people. It seemed like nothing had happened and that we were stuck in a never ending time loop. The party started up again in 2014 as the chaotic world events began to reflect the inner changes in people. The end of 2014 and the beginning of 2015 brought wave after wave of transformational energies which have sent the general population into a tailspin that will most assuredly change the world forever. Look back to 2012 and review the way you have changed since then. Are you a different person? Do you have a better understanding of what has happened in humanity’s past and what is currently happening to our DNA? By looking back at the beginning of the acceleration and how you have changed, you can get a good idea of how you will be handling the energies of Wave X. Those that have taken a fast track awakening have literally transformed 180 degrees in the last five years. These are the people who were literally “asleep” and all of the sudden had a huge awakening that something was very wrong in their lives and there was an urgency to find out what it was. This led to dedicating most of their time into research while following thread after thread in order to find out the truth of who they are and why they are here. The fast track individuals had an especially challenging time integrating the energies through their bodies in such a short time. These people may have had major flu like ascension symptoms two or three times since then as the body was detoxified and energetically cleansed. They have had to work really hard through a few “deaths” of the ego and lower personalities in the “Dark Night of the Soul” phase. Most fast track people will integrate the Wave X energies with swiftness and grace. They are used to change and are not afraid to dedicate every second of their lives to integration and exploration. How far the fast track people will take it depends on the amount of integration what has been done in this lifetime coupled with the overall soul integration and experience. Those that have been awake and integrating energies for many years and some since the Harmonic Convergence of 1987 have chosen the route of the Pioneer. They had to set the stage for the massive amount of people to begin to awaken since 2012. The Pioneers’ work included gridwork, energy healing, psychic readings, channeling, and writing to explain to the future lightbringers what would be in store for them. The Pioneers chose a long and steady path of shifting and preparing that has prepared them for Wave X due to the experience and wisdom they have accumulated in this lifetime. Many of the Pioneers have done this type of work in other lifetimes and may have been awake and aware of who they are and what they needed to do since childhood. Just because a pioneer has been doing this their whole life does not guarantee a golden ticket through the changes that are happening on the planet at this time. Some may actually find this time extremely difficult because they are usually a few generations removed which naturally means they might be resistant to sudden change. How a Pioneer integrates the upcoming galactic wave will depend on how much they are willing to give up their well established practices as everything changes into a new co-creative and interactive stage of quickly blossoming revelations. A guaranteed method of integration of Wave for the Pioneers would include letting go and being their true authentic self. The beautiful merging of Pioneer energy with the Indigo energy will build a bridge for many of the Fast Trackers to integrate this new energy and to become prominent leaders and teachers of today. The Star Children and Indigos can be grouped together because they are the game changers. Star Children are today’s children who know who they are and possibly already have three stands or more of DNA activated. Indigos include children and adults who have always known they are here to anchor the new energies and to go through this shift in consciousness with the planet. The Star Children and Indigos are already tuning into Wave X as it approaches the planet and are anchoring the energies in advance in order to help step down the galactic frequency a little at a time because the energy is too refined to assimilate all at once. Indigo adults can be fast trackers if they took a long time to awaken to who they are and why the came. Once awake, they had to hurry and catch up on their personal work in order to know what to do when the big waves of energy came. Just by being incarnated here with their light on the planet at this time, Star Children and Indigos will have completed their mission. Everyone has played an important role in preparing for the planet to receive her cleansing Wave X energies. There is no limit to what can be accomplished with these energies. A twelve strand DNA allows twelve dimensions to be accessed, and doors that have been closed for thousands of years will be open. You have to be willing to find the doors and walk through them. You will find that you can return to Source any time you wish to bask in the void of love and peace. After you have fulfilled the emptiness inside of you that always longed to go home, you will gain a whole new appreciation for Earth and the physical body experience she provides. “I first found myself floating in a mostly dark space. Off into the distance in all directions, there were huge bubbles that I assumed were the many 4th dimensional synthetic realities created by the various deities, ascended masters, and arch angels to name a few that George Kavassilas has referenced many times. My guidance has always been to avoid these, go around them and not engage. Then, a tunnel or worm hole opened up that led me through the great void that separates the 4th dimension from the 5th. My higher self could be seen at the other end of this tunnel urging me on like a cheerleader. Once through the tunnel, I proceeded to traverse the dimensions leading up to the stargate at the center of the Milky Way Galaxy. There are many other realities in dimensions 5 through 8 that I could see, but again, my mission was to not engage with any of them. Also, at this point I glanced behind me and was surprised to see that a whole host of beings were training behind, almost like the tail of a comet. My interpretation of this is that whenever an individual embarks on this final journey, there are others, perhaps from the same soul family that exit the 4th dimensional arena at the same time so that they can all transcend together. The normal harvesting of informational patterns that occurs in the 9th dimensional center of the Stargate Milky Way seemed very brief this time around. This tells me that one needs to be fairly clear down here in 3D before this journey even starts. On to the dimensions from 10 through 12. As I have said before, once one pops out the other side of the Stargate Milky Way, everyone looks and feels pretty much the same. Here is where the real group consciousness is created. I could feel myself becoming bigger and more expansive as I merged with other consciousnesses that were on the same journey as I was. Perhaps I was merging with those many beings who were following me. All of this was very well organized, too, as in the patterning of sacred geometry. This consciousness that I was now a part of kept vibrating higher, getting bigger and more expansive, and was moving faster as it approached the exit portal for this universe. It seemed as if the now bigger me had become as large as our universe itself at this point. I popped through the portal and caught a brief glance of the many universes that exist in the multiverse. Clearly I was not stopping there to explore any of them. After some time, I ended up merging into a field of energy that I can only describe from my earthly viewpoint as ‘All that Is’ or the ‘Source’. This space was a pale golden color without any shapes or energy flows. It was perfectly pure and uniform. Nothing, so to speak, was happening there! I would even describe it as lacking any consciousness whatsoever, as the presence of consciousness would indicate some sort of thought processes at work, and there was none of this going on. Imagine being in a space that was totally neutral and devoid of movement, sound, emotion, thoughts, needs, or goals, and was totally in the now without any urge to go to the past or the future. It was everything and at the same time nothing. So hard to describe. Read Part two of Carla’s blog HERE. Most people that have intentions to “move into the fifth dimension” will be pleasantly surprised when they will have access to higher dimensions and places in space and time outside of the constraining matrix overlay we have been trapped in. As more people explore outside of the prison walls, the false light matrix will no longer be supported and will dissolve. Access to higher dimensions will not necessarily unfold in linear fashion. As multidimensional beings, we have always been connected to all dimensions but have forgotten how to access them. Many people who have advanced metaphysical abilities will experience an opening that will allow them to be the teachers of abilities they never dreamed possible. People who are already reaching areas past the astral are going even further. Those who are already channeling information from their higher selves will have instant access to Universal Akashic records. In the very near future, teleportation should be possible through the dematerialization and re-materialization of the physical body as our bodies transform into more of a light body than a physical dense body. Regeneration and rejuvenation of the physical body will take care of all diseases and aging. Manifesting anything you need from the background energy will provide for limitless creation coupled with creative responsibility. Those who have readied themselves for the manifestation of metaphysical abilities through healing and clearing will be able to tap into them with the introduction of Wave X. This is truly an exciting time to be alive on the planet no matter what chaos unravels around this transformation and upgraded capability. The Indigos and Star Children will invent and manufacture the technology needed to clean the planet up. Those who have proven to be negative and service to self will be split from those who operate out of love and harmony. The world will be changed forever, not just a thousand years. How much the world will change will depend upon us, and how fast we get there will depend on how quickly we can dissolve the constraints. How big are you willing to dream? Will Wave X change the world in an instant? The world has already changed in the future. Outside of time, the world is perfect. The route to merging perfection with the now in physicality and the time it will take to manifest this perfection depends upon humanity. While some people will definitely be changed immediately when the energy wave comes in September, others will struggle to know what hit them. Prepare yourselves now with the intention that you have no limits to what you can do with this energy. Find out more about preparation and “Wave X” in my interview with Dr. Simon Atkins. Simon will be returning to the Cosmic Awakening Show August 27 with an update! Editor’s note: In5d has been reporting on this energy shift for many years in preparation for this massive upcoming event. Many people have prophesized this shift at this time and have confirmed events that prove we are going through an acceleration. For more information, follow the hyperlinks in this article for more information on each subject, and be sure to utilize the search button on In5d.com for more information in archives articles. Michelle WallingMichelle Walling is a Certified Holistic Life Coach, webmaster, writer, and and Radio Host on In5d radio’s The Cosmic Awakening Show. As a truth seeker, she is committed to share her experiences with the world. Michelle has joined forces with Gregg Prescott as an admin for the In5d Facebook page, as an assistant for In5d Events, and as a contributing author for In5D. All of Michelle Walling’s articles and radio appearances can be found on her database CosmicStarseeds.com. Holistic Counseling sessions can be booked through her website MichelleWalling.com. The truth about the holographic nature of the matrix and how we are going to dissolve it can be explored on her website Howtoexitthematrix.com. Michelle’s personal Facebook page can be found here. What Will Happen When The Veil Lifts? Follow In5D and Body, Mind, Soul, & Spirit on TSU! This social networking platform is by invitation only, so consider this YOUR invitation by clicking the link below! © 2015 In5D Esoteric, Metaphysical, and Spiritual Database. All rights reserved. Theme by Solostream. I was unaware that this book (or parts of it) had been made into a video, until today ... its been up on Utube for three years but today is the day, I assume, the Universe (higher self) thought it would be appropriate for me to "see" it ... and of course, I wanted to share it with you all ... whether you read the book or not, it was a pleasant "refresher" - for me... I liked the visuals and the music.... the "sound" of the Sun. Our solar system is passing through a cloud of interstellar material that shouldn't be there, astronomers say. And now the decades-old Voyager spacecraft have helped solved the mystery. The cloud is called the "Local Fluff." It's about 30 light-years wide and holds a wispy mix of hydrogen and helium atoms, according to a NASA statement released today. Stars that exploded nearby, about 10 million years ago, should have crushed the Fluff or blown it away. So what's holding the Fluff in place? "Using data from Voyager, we have discovered a strong magnetic field just outside the solar system," explained Merav Opher, a NASA Heliophysics Guest Investigator from George Mason University. "This magnetic field holds the interstellar cloud together ["The Fluff"] and solves the long-standing puzzle of how it can exist at all." The Fluff is much more strongly magnetized than anyone had previously suspected," Opher said. "This magnetic field can provide the extra pressure required to resist destruction." Interesting times, it seems almost everyone in the alt-media is expecting something to happen in September. I just hope we don't have a 2012 repeat, haha. We'll see. I am noticing its affects on my Consciousness ... it's not just "wishful thinking" ... we are "shifting" - whether you choose to believe it or not. September 2015, there is a powerful wave of gamma light coming from the Galactic Core. This intergalactic WAVE X energy will be coming through to Earth at maximum strength and peaking on September 28th. We are already well into it and feeling its effects. It happens every 3,600 years, and is being called “The Event Horizon.” It is the next step in the evolutionary cycle of man. are you feeling it? ... are you seeing its effect on your "local universe" ... because I AM ... and I am love'n it ... omg - so exciting! yes, nothing lost, nothing wasted ... we are contributing to ALL that IS ... as intended by Our Creator. Welcome to the Matrix by: Philip D-ick, Sylvester James Gates, Thomas Campbell, Sam Harris, Nick Bostrom, Dr. Quantum, The Matrix, Albert Einstein, Virtual Reality, Adinkras, Superstring Theory, Eugene Wigner, Quantum Physics, Quantum Mechanics, Double Slit Experiment, Sumerian Tablets, Pineal Gland, DMT, Nag Hammadi, Gospel of Thomas, Gnosticism, Gnosis, Dale B. Martin - Woolsey Professor of Religious Studies at Yale University.